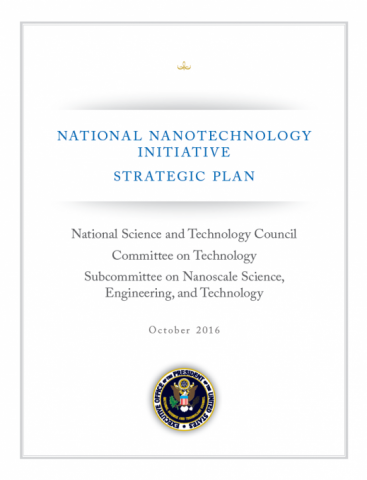 With the recent publication on the 2016 National Nanotechnology Initiative (NNI) strategic plan last month, we are provided insight on refinements of the major goals along with emerging initiatives and strategies that have been implemented to address the comments and objectives mapped out in prior years. Since the inception of the NNI going back on the order of two decades, nanotechnology has evolved from an area of fundamental research focused on understanding and exploiting the phenomena that occur at the nanoscale to what has now become a broadly enabling technology positioned to realize substantial societal and economic benefits. In recognition of this potential impact, the focus of the NNI has broadened from investments in fundamental research in nanomaterials and nanotechnology-enabled devices to include activities directed at how these novel materials and devices can be incorporated into nanotechnology-enabled systems through nanomanufacturing methodologies. In this context, a key goal of the NNI strategic plan has been to foster methods for the effective transfer of technology for commercial and societal benefit. In order to achieve the goals of the strategic plan, NNI agencies implement a range of initiatives and strategies to encourage methodologies leading to new opportunities for technology transfer, innovation, entrepreneurship, and commercialization. These initiatives are executed through a balanced combination of grants to single investigators, collaborative research teams, and networks, research centers, and user facilities. Example initiatives include the expansion of small business innovative research (SBIR) and technology transfer (STTR) program grants to industry across the NNI agencies, the NSF Innovation Corps (I-Corps), the NIH Translation of Nanotechnology in Cancer Consortium, and the NanoBioManufacturing Consortium (NBMC) sponsored by the Air Force research Laboratory. An essential component for improving U.S. competitiveness in both the fundamental science and commercialization includes coordinated education and workforce training activities and programs. The NSF has an impressive legacy in establishing the NISE Network and K-12 education and outreach, and now is coordinating with other agencies, along with state and local entities to create transitional workforce training experiences enabling students and workers to expand their horizons and obtain a broader sense of job markets of the future. Other implementations by NNI agencies towards key goals of the strategic plan over the past two years includes emphasis on the safe handling of nanomaterials and environmental implications, with a series of informational webinars having been produced for the public. As a strategy towards accelerating nanotechnology development in topical areas of national importance, the Nanotechnology Signature Initiatives (NSIs) were formed to enhance coordination and collaboration among the participating agencies and to engage with the public. Grand challenges were adopted in 2016 as a mechanism to bring together the NNI collaboration ecosystem, including the Federal Government, industry, and academia, to pursue ambitious but achievable goals that address problems confronting the Nation. In concert with these many activities in response to previous recommendations within the strategic plan has been progress on a series of infrastructural activities such as standards, intellectual property, and regulatory issues. These provide the essential building blocks to create a sustainable ecosystem in nanotechnology that will accelerate the activities towards commercial viability, as well as foster a more sustainable environment for future impact of this critical area of public and private investment. As such, the NNN continues to support the NNI strategic plan in many capacities, contributing towards all of the key goals through information exchange, outreach, roadmapping workshops, and interfacing with other federal, state, and local initiative fostering public-private approaches towards a sustainable nanomanufacturing roadmap. The NNN encourage our stakeholders to review the 2016 NNI Strategic Plan and provide feedback as to the best practices for implement initiatives that will progress the goals objectives set forth.